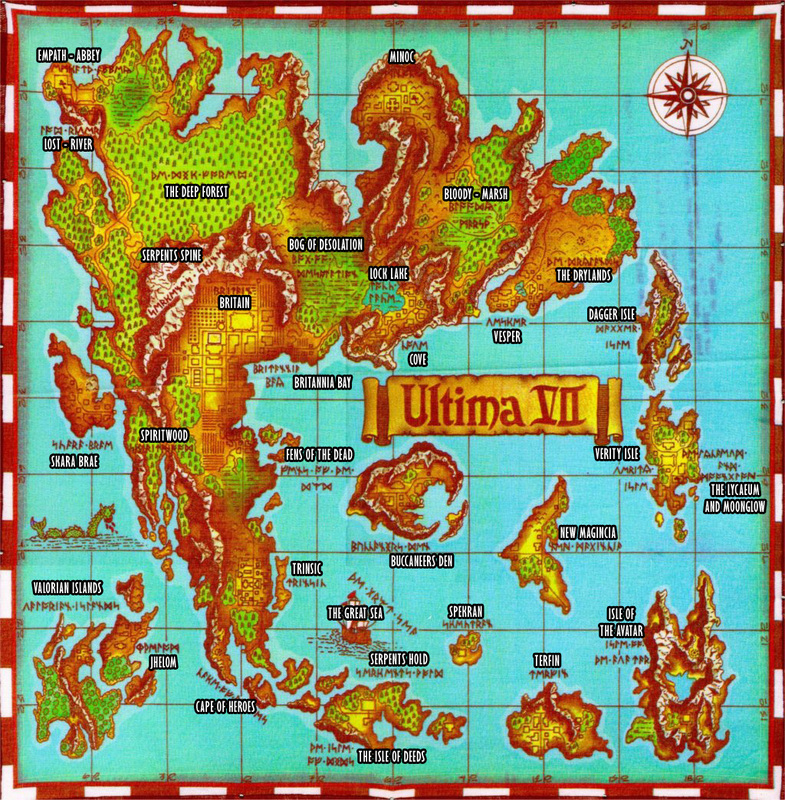 Ultima VII is the seventh of the cardinal parts of the Ultima series of computer role-playing games. The game was released in two parts, Ultima VII: The Black Gate (1992), and Ultima VII Part Two: Serpent Isle (1993). Aside of the direct continuation of the plot, the two parts are independent of each other. There are also respective expansion disks, Ultima VII: Forge of Virtue and Ultima VII Part Two: Silver Seed. The very latest releases of the game have included both parts and both of the expansion disks. The events of Ultima Underworld II: Labyrinth of Worlds take place between the two parts of Ultima VII. While that sidequest is referenced in Serpent Isle, it is not mandatory to play that game to follow the plot. In Ultima VII, an emphasis is placed upon open-ended exploration. After the first hour of each part, the player is able to travel the length and breadth of the surrounding countryside. In The Black Gate, a player is largely free to explore the entire world from the very beginning, while Serpent Isle is more linear until the later stages of the game. Ultima VII features less emphasis on behaving 'virtuously' than other installments in the Ultima series; The Avatar can steal and murder to his or her heart's content without 'breaking the game'. Not only can The Avatar learn a resurrection spell, but he or she can also drag corpses to a healer, or Lord British, to have their lives restored. Resurrected persons will have no memory of The Avatar's misdeeds, so if a player experiences a mutiny due to his or her wickedness, they may butcher their comrades, ressurrect them, and then bring them back in tow. The character dialogue and narrative text in the Ultima VII collection is written in a somewhat medieval style. The gameworld inhabitants, most of them unique, generally 'feel' like three-dimensional people, each with their own speaking style, interests, eating and sleeping habits, friends, enemies, and sometimes, perversions. While the role-playing genre has, historically-speaking, been rife with linear story arcs, Ultima VII allows the player to travel about on a whim, interacting with Brittania's inhabitants as they see fit. There are no 'quests' per se, though the completion of certain goals (especially the main plotline) does of course hold a rigid order in who must be talked to first, what objects must be found when, and so on. One element, unique to The Black Gate, is that 'un-virtuous' behaviour is mocked by the seemingly-omniscient Guardian. For example, after stealing a sword from the Trinsic smithy, the player might hear the voice of The Guardian, who would warn, "You had best not do that, Avatar".